There are a few things in this world that I am rather fond of. . . one of them is my little sister, another is cupcakes, and yet another is anime. 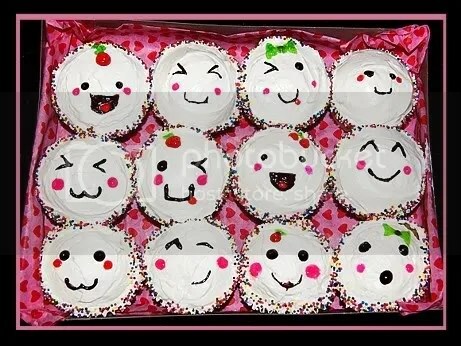 So when said sister approached me with her dilemma of selecting an appropriate gift for the birthday of an anime-loving coworker, it didn’t take me too long to suggest that we make her a batch kawaii cupcakes! She agreed, of course, and after work one evening came over and made the cuppies. I decorated them after they cooled, giving each a kawaii little face (my sis handled the rainbow-sprinkle ring) and created their package from a gift-box, which we then adorned with 3 Japanese-esque food-shaped erasers and a giftcard that my sister picked up for her friend. I’ve never done anything like this before, so the resulting cuteness took me completely by surprise. When all was said and done, they were so damn adorable that I didn’t want to part with them (although I doubt that I’d have been able to kill eat the little guys)! So I took a picture (which really doesn’t do their sheer adorableness justice at all), and I figured I might as well post it up here, in the off chance that they might bring a smile to someone out there on the old WWW! Co-worker girl loved the birthday gift, and fiercely guarded her little pets from the hungry maws of the rest of the office staff all day (those of you that work in an office should be able to appreciate just how difficult that must have been). In fact, she still hadn’t eaten a single one 2 days later! I’m thrilled that she liked her little cuppies, but I really do wonder if she ever managed to eat one. . .
Those are so super cute! I made up a batch of cupcakes for Vday this year and loved how they turned out so much I actually texted photos to anyone I thought might appreciate the cuteness- so I understand the having to take a photo. Those are SO cute!! I love them, but I’m not sure I could eat them either and I’m not even into anime! So nice of you to help your sis out with those cupcakes. Great job! Those are really cute! I’m not into anime either, but they are just cute in general. 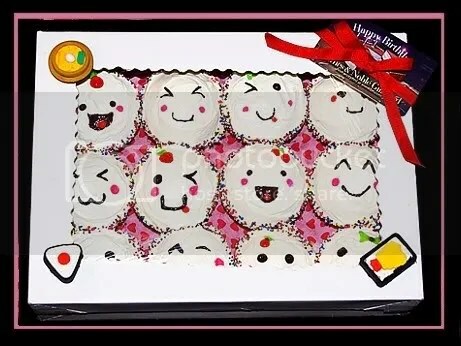 I would definitely be able to to eat them, as I love cake (especially choc. ), so I can’t believe she hadn’t even eaten 1 after 2 whole days!! I can’t believe little miss Teagan didn’t get one, LOL. You are soo talented! They are adorable.